One of DVO's special partners, The Prepared Pantry (www.preparedpantry.com), comes up with all sorts of really clever ideas on a regular basis. Their latest idea is no exception. I'm speaking of cupcake sandwiches. Master chef and owner of Prepared Pantry, Dennis Weaver, says "Cupcake sandwiches are easy, fun, and scrumptious. 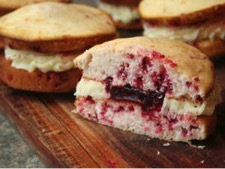 Consider Raspberry Cream Cupcake Sandwiches, Lemon Pie Cupcake Sandwiches, and Chocolate Fudge Cupcake Sandwiches. My daughter, Debbie, made some Wormy Green Apple Cupcake Sandwiches. She added green food coloring to the cake mix, used apple filling between the layers, and dangled some gummy worms out of the filling. Very cute and scrumptious!" Dennis goes on to say that you can make all these and any more your imagination comes up with, with a boxed cake mix and can of frosting. These become eye-popping and easy desserts that you just don't see every day. So how do you do it? You take two cupcake tops (just the tops) and make a sandwich with frosting or frosting and pastry filling between the two. It's a simple concept. But how do you make the tops? Scoop batter into the depressions on a CUPCAKE TOP pan. (Did you know there was such a thing?) Bake the tops until an inserted toothpick comes out clean. 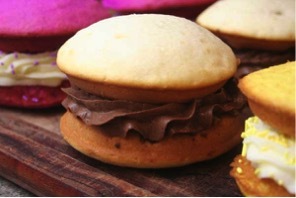 Then once you have your baked tops, add some frosting and another top, and voila, you have a cupcake sandwich. And like Dennis' daughter did when making wormy Green Apple Cupcake Sandwiches, you can "doctor-up" the cake mix by adding colors, flavors, candies, etc. 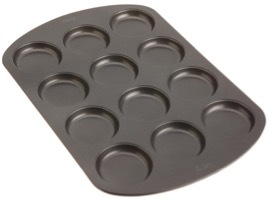 A typical cupcake top pan (also known as a muffin top pan) from Chicago Metallic can be found on amazon.com for around $14. OR you can go the Whoopie Pan route. 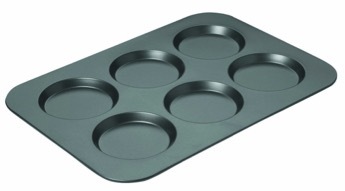 A Wilton nonstick 12-cavity pan runs around $7 on amazon.com. Any of these pans will work just fine. I can see using this idea for all sorts of events. Orange cupcake tops and chocolate frosting for a Halloween party, red cupcake tops with green frosting for a Christmas gathering, pink cupcake tops and yellow frosting for a spring soiree, red cupcakes with layers of blue and white frosting for a 4 th of July celebration…you get the picture. So a BIG "thank you" goes to our friend and partner Dennis Weaver over at Prepared pantry for turning on the creative juices in yours truly! And now I'm off to give that Wormy Green Apple Cupcake Sandwich idea a try-we've got a birthday party for a little grandson coming up and I bet he'll love them!